Can Andrew Luck (left) lead the Cardinals to a big win? After four weeks of the CFB season, Andrew Luck hasn’t really been tested. Stanford have coasted to big wins against Sacramento State, UCLA, Wake Forest and Notre Dame. With a 19th ranked rushing attack that’s averaged 223 yards per game, they’ve been able to control the clock and ease to four wins. Luck’s numbers in the two tougher games (UCLA and Notre Dame) were unremarkable – he completed just 46% of his passes against the Bruins in a 151-yard performance. Against the Irish, he threw two picks for 238 yards and completed 19 of 32 overall. When I’ve watched Luck the words ‘game manager’ jump out at you and the numbers don’t do anything to dispel that. However, this weekend’s test at Oregon could define his draft potential either way. The Ducks are also unbeaten with an even better ground game (4th overall, averaging 317 yards per game) and they’ve scored more points than any team in the country (58 points per game). They haven’t faced an opposition like Stanford yet, but clearly they’re a prolific offense who will score points. Stanford and their quarterback will have to keep up. If Oregon go ahead early, this will test Luck. If it gets to 14-0 or worse, Stanford won’t be able to chip away on the ground and manage the situation. They’ll be forced to pass and Luck will have to take the initiative. When Florida State traveled to Oklahoma in week two, Seminoles quarterback Christian Ponder couldn’t keep up with the Sooners offense and became eratic in a performance that hindered his stock. Luck will have to cope better than Ponder did that day to maintain lofty consideration as a potential #1 pick. This is essentially the issue I have with Luck. Whilst he’ll probably ride a winning record with Stanford and go to a Bowl game, when has he been the focal point? Toby Gerhart was the star last season and almost won the Heisman. There’s no Gerhart now, but in his place are a stable or running backs who have maintained the high level of ground production. Can Luck stay with a big scoring, highly ranked offense like Oregon’s? When the situation demands he use his arm regularly, can he complete +60% of his passes and get the big yards? Last year Luck put in one of his best performances against Oregon at home, helping the Cardinal to a high scoring win 51-42, completing twelve passes for 251 yards and a pair of scores. On the road he generally struggled – 40% completion rate against Oregon State in a comprehensive defeat and 48% completions against Washington State in a mediocre win. If he can go to Oregon and put up solid numbers, that will do a lot for his draft prospects. Winning the game isn’t crucial on a personal level, he just needs to perform and show he’s more than just a game-manager. This week’s update comes two-days early. Mock drafts this early are always difficult and this remains a loose projection at best. We’re still yet to see the likes of A.J. Green and Robert Quinn in action this year due to suspension, although Green returns after week four. However, I’m starting to feel like we’re getting there slowly and some prospects are starting to make their move to secure high grades. 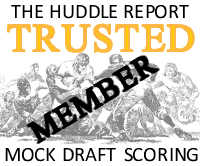 You can see the updated mock draft by clicking here. Mark Ingram deserves to go as early as I’ve placed him. I truly believe he’s a star in the making and he could be the best overall prospect in this draft class. It’s close between Ingram, Patrick Peterson (CB, LSU) and A.J. Green (WR, Georgia) – all underclassmen. I have no issues placing a running back this early because he’s good enough. He’ll be a star. I went back and watched last year’s BCS Title game against Texas. I went back and watched ‘Bama’s win over Florida. I watched Saturday’s win at Arkansas. Ingram will start in week one next year (health permitting) and he will win games of football. I’m not convinced Ryan Kerrigan will necessarily go this early due to a lack of elite edge burst, but he’s moving up the board. With five sacks so far, if he continues to produce his stock will continue to rise. He’s a relentless pass rusher with solid production who’s compared favorably to Chris Long. Kerrigan won’t go 2nd overall like Long and some teams will be wary of the comparison. However – it could help him crack the first round and potentially go top-15. No pick for the Seahawks this time round as it’s only a top-15 projection. This is the first time since the blog started that I haven’t included Seattle in a mock, because they’ve always been amongst the early selections. Whilst they share a lead of the NFC West and with Arizona scraping past Oakland and St. Louis, ranking Seattle #1 in the NFC West is enough to see them picking 21st overall at best. Therefore, no pick this time round – which is a positive for the team’s ambitions. The quarterback debate continues to rage on. Here’s the issue I have – for differing reasons I have major concerns with Andrew Luck, Ryan Mallett and Jake Locker – the only three realistic candidates to go early in 2011. Although concerns also surfaced on Matt Stafford, Mark Sanchez and Sam Bradford, none of the previous mentioned trio match up to the most recent top draft picks at the position. You have to believe one will go early, probably even first overall, because of the importance of the QB position. I’ve gone with Andrew Luck not because I’m high on his pro-prospects (I think he could be Joey Harrington mark II). I’ve gone with Luck because whilst he carries the lowest ceiling, he also offers the least risk. One poor team will believe he can start early because of that, alongside his humble personality, intelligence and winning season with Stanford. In reality, I’m not sure he isn’t just a game-manager in college who is yet to dominate with his arm and whom relies on one of the best ground games in CFB. I’ve also left Locker and Mallett out of the top-15 for the first time despite a few teams really needing a franchise quarterback. Locker may fall because for me, despite his huge potential he simply is nowhere near ready to start in the NFL. He absolutely must have a two-year redshirt period similar to Aaron Rodgers in Green Bay. Of course, all rookie QB’s could use that. However, Locker needs it more than most. That could easily put some teams off and lead to a slight fall into the 20’s. Mallett has great physical qualities but he too has a lot to learn and concerns remain about his character and ability to lead a franchise. A lot of quarterback needy teams didn’t entertain selecting Jimmy Clausen last year, so it wouldn’t surprise me if they were over cautious again in 2011. The Seahawks have many issues at the moment as the rebuild continues under Pete Carroll. Clearly the team is in need of someone capable of rushing the passer consistently and effectively. Whilst the Seahawks have found production from their young group of receivers, do they still lack that #1 guy that can scare teams into greater coverage? Do they need more in the secondary? And perhaps more than anything – can they answer the question about the long term future at quarterback? Having said that, the first round of the draft isn’t the only way or necessarily the easiest way to fill those holes. I wrote at the end of August about how difficult it has been in recent years to find effective pass rushers in the first round. This year’s group of big name quarterbacks have flattered to deceive and you have to ask whether the Seahawks could trust their long term success in the hands of Locker, Luck or Mallett in round one. When I watch the Seahawks’ offense I still think it lacks an identity. Of course there’s the recognisable presence of Matt Hasselbeck, but at 35-years of age he’s more game-manager than game-winner these days. There’s promise amongst the young receivers, but not a dominant playmaker. Like most teams it’s a running back committee, yet none of the backs have stood out in a struggling run game. Finding one guy to hang your hat on would, for me, be of tremendous benefit for the Seahawks. Mark Ingram (RB, Alabama) could be that guy. Of course it’s not the en vogue suggestion these days is it? People often don’t want to discuss drafting a running back early. The feeling is that backs can be found later on and that the days of one franchise runner carrying the load are in the past. None of that is false. Why I want to argue the case for going against this though is my belief that Ingram is capable of lifting a team so much from day one that it’d potentially give the Seahawks an identity as soon as the pick was called. He may have the complete package. He’s a thick-set guy with ideal size (5’10”, 215lbs) who owns the kind of one-cut ability needed to thrive in a ZBS. He’s got great vision and patience and consistently sets up his blocks better than a lot of guys in the NFL. He’ll run over you or around you – it’s a great no-nonsense style and determination to get the job done which is emphasised by how difficult he is to bring down. Watch Ingram after the initial contact – even on a good solid tackle he’ll make an extra buck or two. He’s got a tremendous stiff arm and hand punch to keep away defenders, not to mention the perfect balance even when he’s knocked off track. Ball security – one fumble in his career so far. That’s it. Need him to pass protect? You get the sense he enjoys it (almost) as much as he does running for a big play downfield. Does he have elite speed? No. He isn’t Chris Johnson in that aspect. Still, he’s plenty fast enough and shows quick acceleration to burst through an opening and kicks through the gears quickly. His top end speed isn’t CJ2k, but his burst should secure a solid time at the combine next year over 40-yards. In two games this year against Duke and Arkansas, he has 308 yards and four touchdowns. This follows his Heisman winning season last year when he recorded 1658 rushing yards and 17 TD’s, accompanying three further scores in the passing game. My only concern coming into this year was whether the physical style might lead to injuries – and he missed the first two games this year with a knock. I guess that will happen. Knowshon Moreno had a physical style at Georgia but never so much as left the field after a hard hit. He comes into the NFL and has issues galore. It’s the risk you take when drafting a running back, but it’s important to remember one of the knocks on Adrian Peterson was his durability and he’s had barely any issues at the next level. Drafting Mark Ingram won’t solve Seattle’s pass rush problems, it won’t secure the quarterback of the future. What it does secure is someone to build around on offense the same way Minnesota built around AP. The Seahawks can’t go out and sign Steve Hutchinson at guard, but if they continue to improve the offensive line (and it’s been a vast improvement so far, even without Russell Okung) there’s no reason why Ingram can’t come into the league and have the same impact as Peterson. He might be that good. Is it a luxury? Some would say yes. I would say no – because whilst like anyone else you’d love to see questions answered elsewhere first, sometimes a guy is too good at his position to ignore. Running back might be a more neglected position these days, but Ingram is going to be a star. That warrants consideration. – Akeem Ayers (DE/OLB, UCLA) was at his dominant best this weekend as the Bruins stunned Texas. He had a sack, forced fumble and an interception on the day. I’ve written about him a lot on this blog, but he’s one to watch. He can play the LEO position in Seattle and he’s just a fantastic playmaker. He can rush off the edge with his hand in the dirt and he can drop back and cover. He’s the kind of guy you bring in and spend days working out packages to maximise his talent. – Ryan Kerrigan (DE, Purdue) might be starting to demand greater respect. He was given a third-round grade by the draft committee last year and returned to Purdue. It’s important to remember that Aaron Curry was given the same grade once, returned to Wake Forest and ended up being a top five pick. Kerrigan may not go that far up the boards, but he’s drawn strong comparisons to Chris Long (2nd overall, 2008) and has five sacks in four games, including two more this weekend against Toledo. He’s a relentless pass rusher off the edge who some believe can be a 10-sack a year guy in the NFL. – Patrick Peterson (CB, LSU) had another big punt return touchdown this weekend against West Virginia. Aside from being virtually a lockdown corner so far this year, he’s registered over 500 return yards and two interceptions. He’s big (6’1″, 221lbs) fast and athletic and will set the combine on fire next year. There’s no doubt in my mind he’s a lock for the top ten next April. We saw the best and worst of Mallett today. At times he flashed the big arm and made some excellent throws. With the score at 20-7 to Arkansas, you had the feeling this was going to be a potential career-definer for Mallett. However, he had what is fast becoming an all too often second half slump and just when his team needed a cool head at QB, he lost his. One ill-advised interception led to the game winning score and the other killed a potential clinching drive for the Hogs. Having said that, there are too many naysayers with Mallett. I appreciate his issues and his talents – he is what he is. Big, superb arm, capable of making mind-blowing plays but also capable of hitting a cold streak at any moment and making a big error. I don’t accept that footwork is a major problem, it’s simply consistency. He made some excellent plays today moving around (especially for a 6’7″ QB) but nobody can legislate for trying to throw it out of bounds and simply lobbing it gently into a DB’s hands (as Mallett did to seal ‘Bama’s win). Overall Mallett hit a lot of underneath throws and is starting to complete a lot of his passes – against good teams too – which is what he was criticised for most last year. He didn’t beat the nations #1 team today, but nobody can say he hasn’t taken a major leap forward this year. With good coaching, that will continue especially at the next level. I’m not convinced his stock changes now compared to 24 hours ago. I’d have no issues giving Ingram a top-ten grade. In fact, in a year when nobody appears to want to justify such a high mark it wouldn’t surprise me if he went higher than a lot of people think. All he does is score yards and touchdowns with almost a complete package of skills. His big TD scamper in the first half was a jaw-dropper and flashed all his skills in one snap. First he makes a brilliant cut, showing off his vision to find the right running lane. He bursts through the hole and shifts two gears quickly before delivering a powerful one handed punch to get away from the first tackle. He maintains his balance despite being knocked off course, before re-adjusting to hammer one more punch and tip-toe into the end zone for a 54-yard score. You could put him on a NFL roster tomorrow and he’ll thrive. Ok – he doesn’t have Chris Johnson speed. If Knowshon Moreno can go 13th overall with his lack of breakaway speed, Ingram can go higher. He always finds an extra 2-3 yards after the tackle. At one stage in this game, he carried what appeared to be every member of the Arkansas defense an extra five yards in an incredible scrum. He’s a work horse and a playmaker who never seems to take a snap off. Even when he’s met in the backfield, Ingram always seems to get back to the original LOS. Did I mention he does it in the big games too? Mark Ingram is just a stud who’s grade suffers because of his position. In a draft year that isn’t likely to be the deepest or richest in quality, Ingram could be a rare sure-thing who walks in on day one and just starts winning. I wanted to see a more disciplined Julio Jones this year and nothing in this game suggested that wasn’t the case. Jones will never put up the big yardage because he plays in a run first offense with a game-manager at QB. He had five catches for 55 yards in this one and did everything asked of him. There were no clumsy drops and he generally got into his routes quickly and looked like the mismatch he should be. Jones’ stats would’ve looked a lot better had Greg McIlroy spotted him wide open down the field on a blown coverage. In terms of potential Jones has the lot. He’s got NFL size (6’4″, 220lbs), his deep speed should test well at the combine and he’s shown he’s got value in YAC. He’s on pace for a little less than a 1000 yards and 8 TD’s. If he can better that and maintain his concentration and focus for a full year, he can be a top-20 pick next April. This wasn’t a great day for Dareus and I’m starting to wonder how all the NCAA suspension issues have hampered him early in 2010. Of course he missed games, but he looks a yard off the pace to me. He picked up an injury in this game which essentially restricted him to being a space eating scarecrow on the defensive line. Largely anonymous throughout, he looked a shadow of the player that lit up the BCS title game against Texas last season. There’s still time for Dareus, but if he’s going to follow Ndamukong Suh and Gerald McCoy in being a top five pick next year, he has to step up now. He got 6.5 sacks last year and he needs to start producing. Can he do it? Bailey started well with an early sack – his first of the new season. However, as the game went on his play gradually slowed until it ground to a sudden halt. Conditions weren’t unfavourable and he spent very little time on the field early on after a series of 3-and-outs for Pittsburgh. So why did his play drop off so much? I’d also like to know why, for a prospect some grade in the top-15 picks, he spent so much time on the sidelines? Miami subbed a lot of their defensive line to keep guys fresh, but Bailey appeared to be off the field as much as he was on it. It’s not even like he was being rested, because he re-entered the field late on in garbage time. He looks the part of a NFL lineman although his best position is probably as a five-technique 3-4 DE, but inconsistent effort and a lack of initial burst will restrict him. I’m not convinced he’s a first round pick. I had sympathy with Baldwin until the final Pittsburgh series of any note. It’d been a very frustrating evening for the 6’3″, 230lbs wide out. His quarterback Tino Sunseri couldn’t cope against Miami’s dominant defense and only threw for 61 yards before getting benched. I wondered if issues at QB would hamper Baldwin in 2010 and it appears that will be the case. If he can’t match or better last year’s numbers (1111 yards, 8 TD’s) it won’t necessarily stop him being a high pick, but he likely won’t maximise his stock. In this game he came agonizingly close to two touchdown passes and finished with just three catches for 23 yards. He’s fluid despite his size and he’ll be a solid possession receiver at the next level who has the frame to be a valuable blocker. I’m not sure he’ll be able to stretch a defense deep, but when there’s no chance of him getting a good downfield throw it’s hard to judge. However, he made a horrible error in the fourth quarter – which is why I lost sympathy for his difficult evening. Back-up QB Pat Bostick threw a perfectly acceptable deep ball to the end zone for Baldwin. There was a size advantage over the defensive back and it probably should’ve been a touchdown. Instead, Baldwin never locates the ball and looks awkward as the DB simply makes a comfortable catch and runs back a huge 74-yard return. To not even make a play on the ball was unacceptable and the visibly frustrated Bostick’s body language said a thousand words. Baldwin wears a visor for some reason, despite it being a night-game. I suggest he gets rid of it. I had hoped to use this game to see how Harris coped against a top wide-out like Jonathan Baldwin. However due to Pittsburgh’s wretched offensive performance, Harris had the easiest game he’ll ever play. He was never tested deep and was able to push up in run support a lot of the time. He made one excellent tackle on running back Dion Lewis – originally standing in a well blocked poor angle, but he athletically arched his body and dived to clip the leg of Lewis and avoided giving up a big gain. His tackling was technically sound the rest of the way, but that won’t justify a high grade. We need to see him tested deep, for his speed and recovery skills. This was a night in which those aspects could not be judged, but he’s one to watch going forward from a University used to producing top DB talent. Spence stood out as the undoubted player of the game. He recorded two sacks on the night and flashed cat-quick reactions at linebacker. He diagnosed plays brilliantly, reacted instantly and made the sure tackle on the ball carrier. He plays at around 6’0″ and 220lbs so I’m not sure how the junior fits in the NFL – he’d have to add weight to stay at linebacker at the next level and that could affect his quicks. He had an equally good game against Ohio State in week two so if he keeps this up scouts will start talking about how he might fit in. Definitely an entertaining player to watch if nothing else. Wes Bunting speculates on potential character issues for Ryan Mallett: “I talked to a scout the other day that said ‘I got stuff on Mallett that nobody knows about.’ There are a lot of concerns on him personally.” It’s not the first time stuff like this has been mentioned, but so far further details haven’t appeared. Draft Insider adds to this subject in conversation with SI.com’s Tony Pauline, “The feeling down in Arkansas is that he’s just a different type of person“. Pauline also says Andrew Luck (QB, Stanford) will declare for the 2011 draft. Bunting also publishes his top-20 Senior prospects. Prince Amukamara (CB, Nebraska) tops the list with Adrian Clayborn (DE, Iowa) at #2. Jake Locker appears at #17. Chris Steuber compares Purdue defensive end Ryan Kerrigan to Chris Long. The Rams DE was drafted second overall by St. Louis in 2008 and Kerrigan has a similar frame and motor. Steuber suggests Kerrigan could enjoy a similar rise up draft boards and be a high pick. Right now, I think he’s a borderline late first round pick at best. However, if he continues to register sacks (three so far) he might enjoy a rise. Long has struggled in the NFL so far and I wonder if teams will be put off by the comparison. Aaron Aloysius offers a 2011 mock draft with the Seahawks taking Alabama wide-out Julio Jones. As with my own mock draft, Andrew Luck goes first overall to the Bills. Walter Cherepinsky updates his 2011 mock draft and has the Seahawks taking Jake Locker 6th overall. The Buffalo Bills take Andrew Luck with the #1 pick. Mel Kiper publishes a new big board, with Jake Locker dropping from the top spot down to #4. There aren’t many other changes, but it’s good to see Akeem Ayers (DE/LB, UCLA) getting some attention. Clemson DE Da’Quan Bowers appears for the first time after a three-sack start to the season. I’ve added a video of Kiper and Todd McShay discussing Jake Locker and other issues for ESPN. We’re three weeks into the CFB season and I’m still finding it hard to judge the 2011 draft. When I wrote my first 2009 mock draft I had Ndamukong Suh, Sam Bradford and Gerald McCoy in the top five. Dez Bryant, Russell Okung and Derrick Morgan all featured early with the likes of Eric Berry, Trent Williams, C.J. Spiller and Joe Haden all amongst the top-20 from day one. Even a young playmaker featured going by the name of Earl Thomas. There are plenty of ‘big names’ that could be high picks next year, but placing them is nearly impossible at this stage. A cluster of suspensions have clouded some prospects’ stock, whilst also robbing us of the opportunity to watch them in action. Inconsistent play hasn’t helped either and a lot of the top prospects haven’t set the world on fire to start the 2010 CFB season. If Buffalo select first overall, surely they’ll take a quarterback? How could they avoid the position? Would they seriously risk missing out on a guy like Christian Ponder at the top of round two to go in a different direction at #1? I can’t see it. In this projection I have Andrew Luck (again) at the #1 spot. I’m not convinced by the Stanford QB and I’m a little worried we’re looking at another Joey Harrington or Brady Quinn – a solid game manager who can’t translate into the pro’s. Nevertheless, some people rate him much higher than I do. He’s less risk/reward than a Locker or Mallett, but I do think he’ll need a supporting cast to be successful at the next level. We’ll see how his year continues, but a big season for Stanford probably helps his stock (as it will Mallett’s especially if he beats Alabama on Saturday). I also wanted to use a mock to throw some names out at cornerback to keep an eye on. It’s potentially a deep class of prospects at that position and somewhere the Seahawks may target next April. Also, compiling this projection again emphasised (to me at least) the lack of top-end quality. A.J. Green has the potential to be an elite receiver, but there’s a lot of questions about the others in the top ten. There doesn’t appear to be a big difference between guys like Akeem Ayers (UCLA), Ryan Kerrigan (Purdue) and Rodney Hudson (Florida State) and the prospects taken a lot earlier. There’s a fair chance none of those three will even be first round picks. Time for another podcast… this week it comes in two parts. The first looks at Ryan Mallett’s performance against Georgia this week. The second part reviews Jake Locker’s future after a bad weekend against Nebraska.